Parting Ways: What does the Stratasys & HP Breakup Mean? With the clamor of the nearly three-year-old announcement that Stratasys and HP were teaming up, I was quite surprised that the news that they were parting company got little attention. All that I can surmise is that this news goes against the rosy prognostications of those predicting a new manufacturing revolution and the coming of the industrial giants to the 3D printing marketplace. And that leads me to the moral of the story. Many of these rosy predictions fail to consider the whole picture. They fall into the trap of “building a better mousetrap and people will flock to it.” Success comes from a complex mix of technology, market and business factors; factors that control the destiny of even giant corporations. In CAD/CAM industry, corporate giants jumped in when the industry was young. IBM, Lockheed and McDonnell Douglas all had programs for sale. Today, Siemens is the only big, multi-interest company that is a major player. Much smaller (but still large), focused companies like PTC and Dessault control the balance. In the early days, both IBM and Xerox had a foot in the industry. Graphtec (imaging and instrumentation product) entered and later exited the 3D printing market. Contex (large format scanners) merged with Z Corporation. Six years later, it sold Z Corp to 3D Systems. A new, low price point 3D printer from Solido (also sold by 3D Systems) failed to generate big volumes. Solido faltered. HP has challenges in its core product lines. Attention is needed. HP discovers that the short-term market size is a fraction of what it needs to build a new business on. HP learns that the industry dynamics don’t fit with its sales, marketing and distribution models. I think that last point is the most relevant, and I think that it is the moral to the moral of the story. 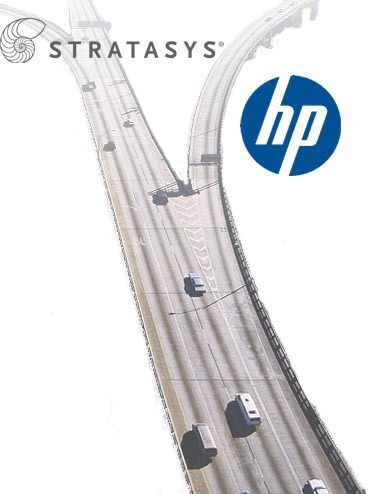 HP’s distribution channel is skilled and adept at selling mature, established products. The prospect doesn’t need educating. Purchasing decisions are made on features, price, perceived quality, support and company reputation. What this means, if I am correct, is that 3D printing is still a consultative sale. It requires conversations and investigation. Well before evaluating price and features, buyers need to understand the product, its capabilities and its limitations to assess if it will be a fitting solution. If this assessment is correct, it bodes poorly for the projections of consumer 3D printer sales skyrocketing in the short term. Sure, sales have been impressive, but they are likely coming from the innovator/risk-taking crowd and those who have coveted 3D printers but couldn’t afford to spend $15,000 or more. As soon as the cherry picking is over, the online retail model won’t work. The consumer will need engagement and consultation to feel comfortable in spending a few hundred, or a few thousand, dollars. The assessment also calls in to question the speculations that Apple or another HP-like company will dive in. They don’t have the business architecture, and likely the interest in building one, to succeed in the consultative, 3D printer sales process. Add to that our market’s size. Apple sold more apps on iTunes in the second quarter ($1.9 billion) than the entire 3D printing market will sell this year. If a giant corporation does come knocking on 3D printing’s door in the next year, it will be a long-term play. It would be a strategic move to gain a foothold in an industry that will continue to evolve and become quite large. It would be a preemptive move in preparation for the time that big corporations enter and succeed in the 3D printing market.